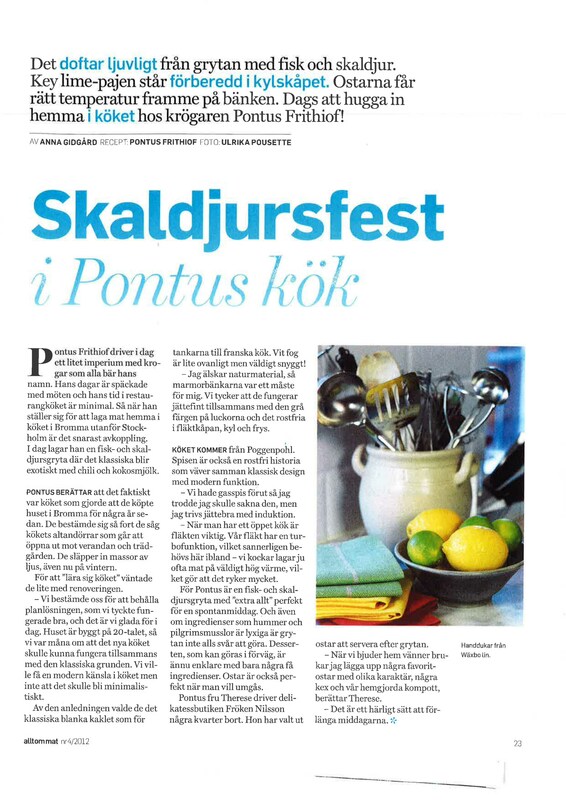 Deborahs Extraknäck has had the honor of being featured in an article in the Swedish food magazine “Allt om Mat” (February 2012 issue) in a reportage at the home of Pontus Frithiof, chef and restaurateur. Pontus has prepared a complete meal starting with a seafood stew flavored with chili and coconut milk, a dessert of key lime pie, rounding up with gourmet cheeses from the specialty food shop “Fröken Nilsson” together with “Deborahs Extraknäck” knäckebröd with pumpkin seeds, black and white sesame seeds and sea salt! Thank you Pontus. Thank you “Fröken Nilsson”. Deborah also spent the afternoon at Fröken Nilsson meeting their customers. Fröken Nilsson chose some beautiful cheeses to complement the different tastes. Great turnout and great feedback. A huge thank you again to Fröken Nilsson! 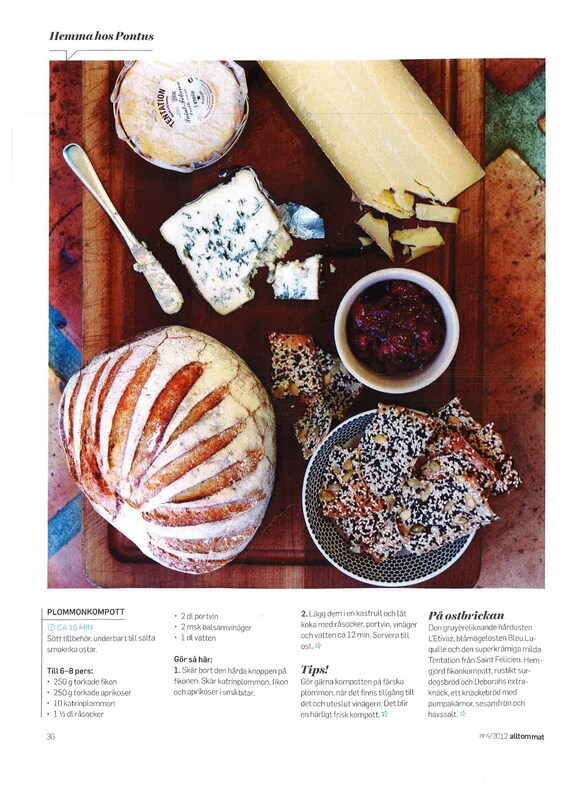 Just found out that DEBORAHS EXTRAKNÄCK was featured in a reportage in the food magazine “Allt om Mat” (jan, fen or march issue). As soon as I get ahold of a copy, I will post it here!! We have just delivered our first order to Systrarna Voltaire’s butik in PUB department store!!!! And not only that, but we just heard that our bread will be featured in their window design!!! YES!! And tomorrow we deliver to Hotel Hellsten on Luntmakargatan in Stockholm for the first time! Needless to say, we are extremely proud!! This past week we had the pleasure of catering an event for The American Club! Fröken Nilsson was kind enough to help us to pick out cheeses to fit with each taste. The evening was an enormous success! Photos and more information are on the way!! As of May 2, 2011, Sabis in Fältöversten is selling our knäckebröd. As of one week ago, Arlanda Fine Foods in terminal 5 at Arlanda Airport in Stockholm is selling our entire line of knäckebröd. And…. as of tomorrow, the 7th of July, Collins Ostbod in Norrtälje will also be selling our entire line of knäckebröd! Our first client outside of Stockholm!! All of us at DEBORAHS EXTRAKNÄCK want to wish all of our clients and devoted followers a wonderful summer!! Enjoy! Now you can buy DEBORAHS EXTRAKNÄCK at “Tysta Mari” in Ostermalms Saluhall in Stockholm! DEBORAHS EXTRAKNÄCK can now be purchased packed in 2 kilogram boxes, for restaurants and catering firms.